If you’re a Twitter fan and still use the web interface a lot, you may be interested in the new “lists” feature that’s being rolled out across accounts. The concept is very similar to the sort of contact management you’ll find in many third-party Twitter applications, except with the added feature that you can make lists public, so other people can follow those people all in one go. For the uninitiated, lists are useful when you have a lot of contacts but would like to separate them into more manageable sets. Say you follow family members, work colleagues, celebrities, some bloggers, and then others you’ve had some kind of conversation with online. Instead of having to wade through a single feed with everyone’s tweets on, you can select to view just the tweets of a particular group, by putting all of those people in a list. Lists can be made private, if you don’t want others to see them, or public. I still think for power Twitter users, using a desktop client for reading and tweeting is the best option, but for keen Twitter users who like the web interface, lists can add just a little bit of clarity to an otherwise cluttered tweet space. 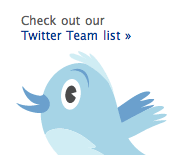 What do you think of Twitter lists?